It was actually Easter I think, a bunch of years ago, when Liam’s cousin Max saw us coming up the front walkway at Gramama’s house and bounded towards us with toy in hand. Racing toward us so quickly and at only three or four years old at the time, I could barely understand him as Max pushed the Darth Vader action figure into my hands. ” the same, the same bleeding machine, he has bleeding machine!” His excitement proving that he had been waiting for us to get there just to show us. ” a bleeding machine?” I asked for clarification, as max let me have the toy and gently grabbed Liam’s hand to say hi to him. “No.” Max said and grabbed onto the circuit tubes connecting Liam’s trach to his ventilator. “BREATHING MACHINE.” He said. Better than even some adults who had met Liam in the early days, it isn’t as complicated as some would make it, his cousins got it. Like it was no big deal. Darth Vader and his cousin Liam. They both need a breathing machine. I’ve always loved that story and that moment, because in Max’s childlike enthusiasm he showed not only that he understood what Liam needed but also that it was pretty cool. I’m thinking Liam’s cousin Max would get a kick out of Liam’s Halloween costume this year. Halloween can be tough one for us. Liam doesn’t eat by mouth so candy is out, most sidewalks and front walkways ( in our neighborhood anyway) aren’t wheelchair accessible, and even school has made costumes on Halloween against the rules, opting instead for a “spirit day” where all students are encouraged to wear black and orange, but NO COSTUMES! Either intimidated by the wheelchair ramp or because there just aren’t that many kids in the neighborhood we only got four trick-or-treaters so even making an event of that part of the night doesn’t work much for us. Basically, it’s hard not to feel isolated when nearly all aspects of the day do little but highlight how different our life as a family can be from so many of the people around us. Even dressing Liam in costume, an act that is essentially only for Facebook and Instagram, can be fraught with difficulty. Long time readers know how important Liam’s dignity and agency are to us. He is a little boy, he isn’t a doll, and so are we dressing him in costume for our entertainment or because society tells us that we must on Halloween. I don’t know. When he was a toddler it was easier. Choosing the right costume for a baby is always more for the parents whether going for adorability or irony (mad men characters? Game of Thrones? Donald Trump?) but at what age do we take into account what a non-verbal Liam wants or does not want to wear? We make it a point to ask Liam to choose his costume, and he does. We ask him if he feels comfortable when he’s wearing it which he generally does, and if he doesn’t it immediately comes off. Thankfully, target has come out with these hooded sweatshirts with a partial mask attached to the hood. 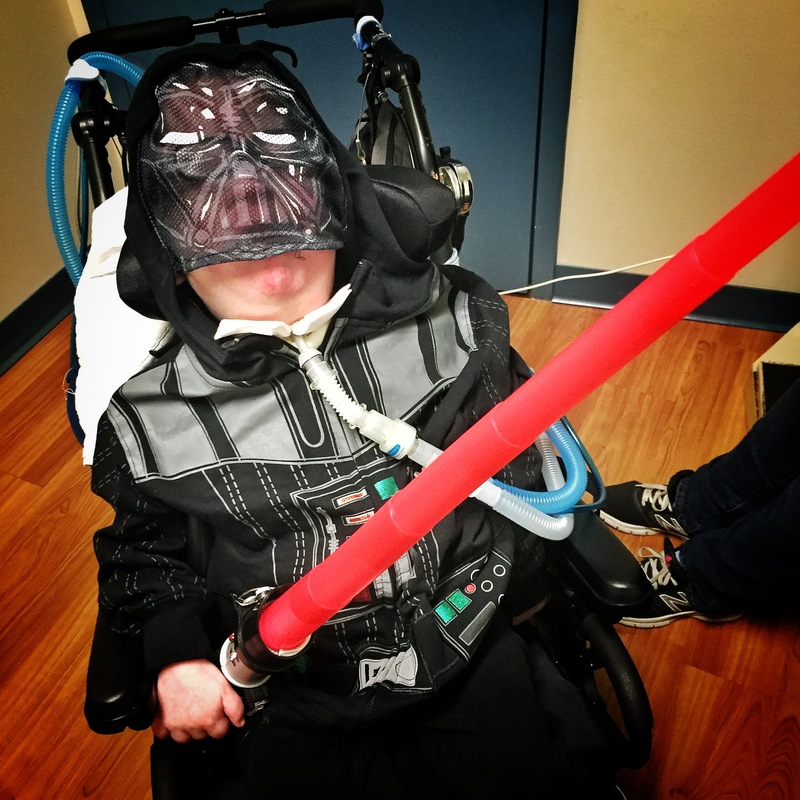 Last year Liam was Captain America, this year he was everyone’s favorite Sith apprentice, while wearing nothing more than a hoodie. Awesome. (This is a blog that doesn’t do ‘brand engagement’ for a number of reasons. But thanks for these Target) they’re so awesome in fact that against the rules or not we send Liam to school in his costume anyway. I can’t wait until they try and tell us we shouldn’t have done it. Showing off his hoodie at school is just about the only Halloween thing he can do. This year we made the best of it. Unfortunately we spent a portion of Halloween at Liam’s pediatrician’s office (long story, he’s fine) but after that we celebrated on our own. Our way. After his grandparents visited with some little toys and crafts for his goodie bag (in lieu of candy), if I could have added large hinges to the wheelchair ramp and raised it like a drawbridge for the rest of the night I would have. 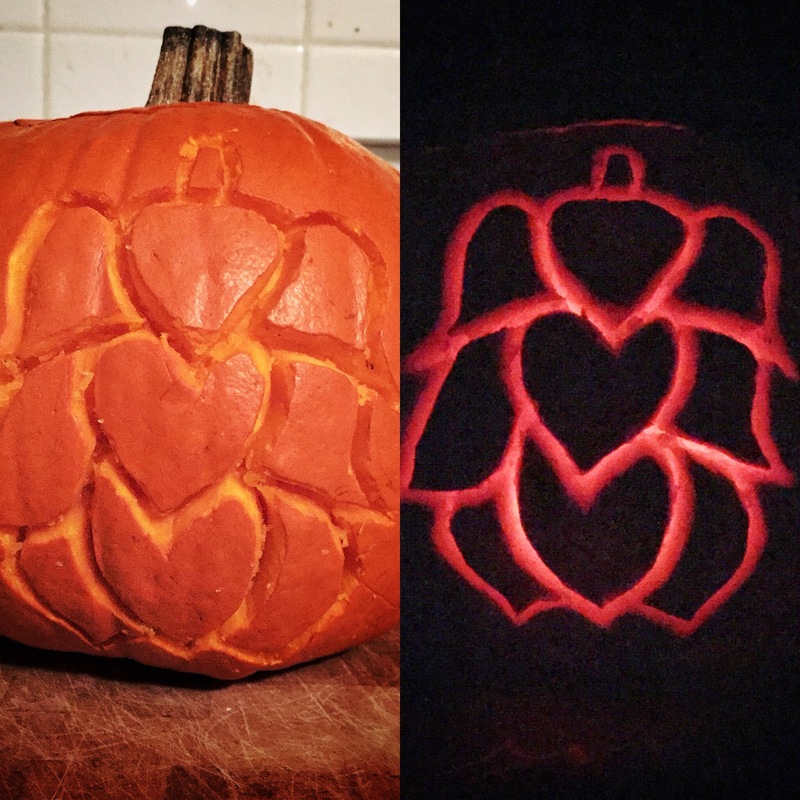 We carved our pumpkins, we baked our seeds, we watched our Bruins (big win!) and soaked in being together as a family. Halloween can be a tough one for us. So we just stopped doing it. You guys do your thing with your candy and haunted houses and trick-or-treating, and crazy far out costumes. We’ll be at home, in our hoodies, being a family. It doesn’t always look like everyone else’s, and it can be vary isolating.